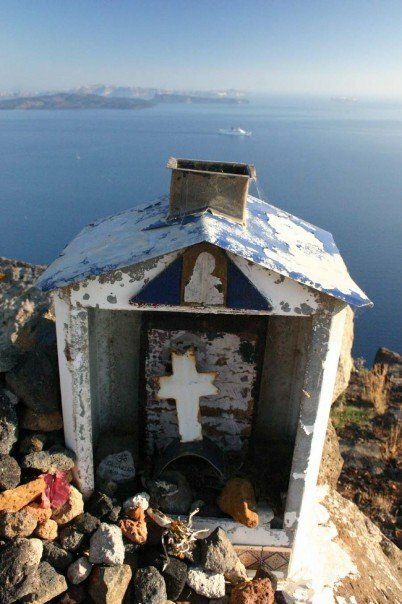 The shrine was visited by my friend Jennifer in 2007: This is how it looked after years of exposure to the sun, rain, wind and saltine air. Haven’t been back to the island since i built the shrine. According to Jennifer it has become a popular stop along a remote hiking trail. Hikers have been maintaining it, writing their names on the rocks, making offerings and leaving possessions. I don’t know when I’ll get back there again. if you are interested in lighting the oil lamp for me let me know. I’ll send you a map and instructions. I buried something special to me under the rocks.